WWE has made a few announcements for next week's episode of Raw. 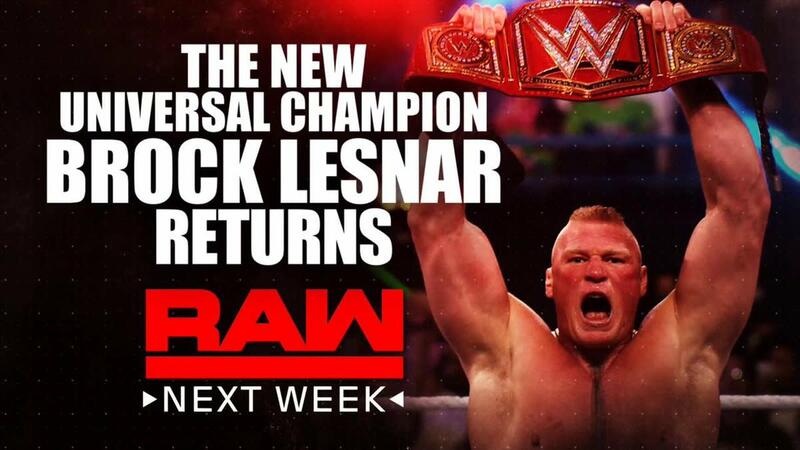 New Universal Champion Brock Lesnar will be appearing on the episode. It will be the first time he's been on WWE television since winning the Universal title at Crown Jewel. Lesnar won the title by defeating Braun Strowman in Riyadh, Saudi Arabia. The story for the match was Baron Corbin hitting Strowman with the title belt before the bell rang, Strowman kicking out of three F5s, Lesnar throwing Strowman over the ropes on an F5, and Lesnar finally pinning Strowman with his fifth F5. Lesnar vs. WWE Champion AJ Styles in a non-title champion vs. champion match is set for Survivor Series later this month. As the build to Survivor Series continues, Stephanie McMahon will also appear on next Monday's Raw. She'll address Shane McMahon winning the World Cup tournament at Crown Jewel. WWE is advertising that Raw's women's team for Survivor Series will be revealed next Monday. Alexa Bliss, who is still out of action after suffering a concussion, was announced as the captain for the team tonight. It was noted that Bliss wouldn't be wrestling in the match. Next week's Raw is taking place after WWE's European tour and is being held at the Sprint Center in Kansas City, Missouri.